This post is an oldie but goodie. But given the recent influx of “glitch” and unpublished airfare sales, it was time to dust it off for the readers. Remember, move quickly to get those great deals. Enjoy! On Christmas Day 2014, thousands of people jumped on “glitch” or error fares on Etihad Airways that allowed them to travel to Abu Dhabi, South Africa, and the Philippines for as low as $200-$300 round trip, including taxes and fees. The fares included multiple cities and spanned much of 2015 with the dates of travel, and also included other amazing destinations like South Africa and the Philippines. Etihad decided to honor the glitch and error fares, and throughout this year I know numerous people who are going on bucket-list vacations for a small fraction of the normal price. This has happened numerous times since then. Just last week, there was a fare from Baltimore to Paris for $214. Two hundred and fourteen dollars…round trip…to Paris! In fact, much of Europe was on sale for less than $400 from the East Coast. And that fare lasted for less than an hour. Before the beginning of this year, I had no idea that there were websites that are devoted to these types of error or “glitch” deals. Now, I check many of them quite frequently or even daily. Two top sites are TheFlightDeal.com and SecretFlying.com. Check these sites early and often (read: perhaps a couple of times a day) to find the best deals. And as TheFlightDeal.com warns, if a sale fare listed on that site is more than a couple of days old, it is likely gone or expired. But this is even more paramount for computer “glitch” deals, which can be gone in a matter of hours. Or, in the case of last week’s fares…minutes. And, of course, glitches require flexibility with dates and times. But if you can get to a bucket list location for a few hundred dollars, you have to be prepared to move on a moment’s notice. This is the stuff dreams are made of. But there are some super sales that are also not advertised that are not technically “glitch” fares, but can afford big savings if you are diligent and flexible with dates. For example, just in the last week there were fares of under $400 round trip from San Francisco to various Asian cities, and Boston to Iceland for $238 round trip. Those unadvertised sales probably last a day or two at max (and true glitches sometimes only last minutes or hours). Final Note: The Department of Transportation has said that airlines are no longer obligated to honor a glitch fare in certain instances. So wait until you have a confirmation and give it a little time before making additional plans. 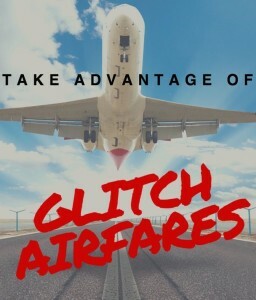 But if you do book a nonrefundable hotel, for example, based on a glitch fare, then the airline is responsible for either honoring the fare or reimbursing you for anything nonrefundable. And remember DO NOT…UNDER ANY CIRCUMSTANCES… CONTACT THE AIRLINE WHILE A GLITCH IS OCCURRING (or even afterwards)! Just sit back and let the magic happen (and don’t ruin it for everyone else by alerting the airlines so they can correct the issue)! For more tips and tricks on how to get the best travel deals and other travel tips, sign up with BarrisTourista to get a 5-Page Travel Deals Mini Guide with ways to scoop up great deals! I know so many people last year who got on the Abu Dhabi glitch! I am doing more traveling hopefully I can find a glitch I can hop on! good tips for those who weren’t in the know already. The Abu Dhabi fare was cool although I still think it wasn’t a glitch and that they did it on purpose. Due to the extensive dates people had ample time to plan. I was happy I caught that deal! Holly, I agree. I think it was planned. It went on most of the day and lasted wayyyy too long. I am glad that people were able hop on it! I just visited the Dominican Republic and took a flight for the first time this year. I was so terrified but now that I’ve done it I really think that I can do it again. Now, I fear I can’t afford it lol! I’ve been looking at several posts lately about cheap airfare and maybe I’ll look into that so I can prepare for my next trip! That’s a really great travel hack! 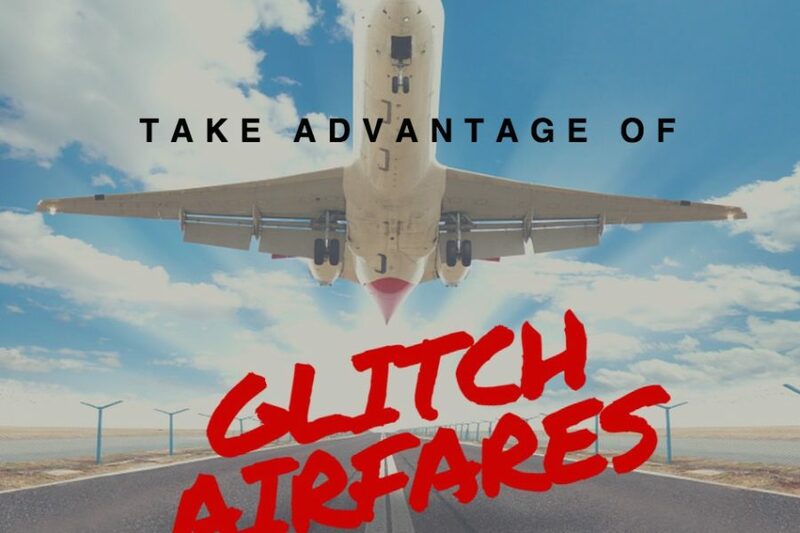 I’ve never even heard of glitch fares before. Will be on the lookout now. Thanks for sharing! When I tell you I was SICK that I missed that Christmas Day glitch!! That’s what I get for paying my family attention and ignoring my social media! Lol great tips and thank you for the sites I will be on them! Those are some really great deals! I wish I flew enough to try to take advantage of glitches. Stacie, these glitches can make you fly more LOL! I have purchased a couple of tickets this year just because they are super low in price. Let that be your excuse LOL! Thanks for the information and the tips. Interesting Glitch airfares must be a hidden secret in the airline industry because I had never heard of this. Will certainly take advantage of this opportunity ….Had doubt about honoring tickets after reading your tips & tricks understand how to navigate the best airlines deals. I have definitely been paying more attention to flight deals recently. That Abu Dhabi deal was definitely a steal. Thanks for sharing this great tip Tyra. No problem, Vashti! I should have jumped on AD when that came out. Oh how I love a good deal. I wish I had the flexibility! But this is good to know anyway because airlines are so expensive. Your final note about the airline honoring the fare or reimbursing you is so key. Have you personally had an airline not honor the fare ? Bree, no I haven’t had that personally happen. This is a recent DOT rule change. But most airlines will honor it, but they are also shutting down those glitches much quicker now. They don’t last nearly as long from what I have seen; they are selling out fast. who is the traveling esquire? I am a lawyer. I am a journalist. I am a writer. I am a photographer. And I love to travel. So I decided to combine all of those loves and The Traveling Esquire was born. I have always been entrepreneurial in spirit. I have never taken the traditional path, but I hope someday to get there (wherever “there” is) all the same. I hope you enjoy my musings and will follow me on my journey. Virtually travel with Tyra! Grab your bags through my blog! And check out my handy resource on saving money while traveling and tools to make money while working remotely! The Traveling Esquire is a participant in the Amazon Services LLC Associates Program, an affiliate advertising program designed to provide a means for sites to earn advertising fees by advertising and linking to amazon.com.